Charming and quiet, we will surprise you with history, views and location. The Katerina apartment is a completely new apartment. It was just renovated and bookings are starting from August 2015. It has two bedrooms, two full bathrooms, a large living room and separated kitchen. The apartments are fully equipped for cooking and just hanging out. There is free Wi Fi and satellite TV too. But maybe the best feature of our apartments is their location. We are directly across from the steps to the castle and just a few minutes walk to Charles Bridge and Old Town. From the cobbled streets and details outside to the hidden gardens nearby that tourists often never find. So you can essentially walk everywhere from here. You might not even use public transport while you're here. It's that easy! The combination of our unique apartment, our historical building and location will make your holiday or vacation unforgettable. We promise. And, we'll be here to help if you need something. We work a bit differently since the apartment is part of a collection of apartments in our residence. So if you need something just stop by my office downstairs. toilet, combination tub/shower, bidet, The bathtub is a hydro massage option. There are two bathrooms in the apartment. One bathroom has a corner shower, toilet and sink. The second bathroom has a hydro massage bathtub with option to stand and shower. It also has a bidet, toilet and sink. The kitchen is fully equipped with dishes and everything you need for cooking. There is a dishwasher, oven, 4-ring stove, fridge and freezer. There are two dining areas in the apartment. There is a small table in the kitchen and a larger round table on one side of the living room. My family of four stayed at the Katerina property over Christmas. Property is clean and recently remodeled. Two large full bathrooms and a well-equipped kitchen. Plenty of room for us to spread out. Location is absolutely perfect. The 208 stairs leading to the castle are immediately at the front door when you leave the property. There is a tram station located a couple of hundred yards away.. It is an easy walk to the Old Town Square via the Charles Bridge. There are plenty of restaurants and shops within an easy walk of the apartment. There was a little street noise from the restaurant next door but nothing too bad. The back bedroom away from the street was very quiet. Dean was very helpful at arranging a taxi from the airport and answering questions. There was a maid for cleaning service every couple of days and she also was available for laundry services. We stayed here for 5 nights. The apartment is spacious and well appointed, with plenty of storage space. It was also well heated, important for a late November stay. The one downside for some would be the lack of a lift to the upper floors but this was not an issue for us. The stairs are shallow and easy to climb. Having an on-site manager/contact was also very helpful. The apartment is incredibly well located. 10 minutes to the Charles Bridge and also 10 minutes, up several flights of stairs that start outside the apartment building, to the castle and cathedral. Lots of restaurants and cafes nearby, plus a small supermarket for breakfast food. St Nicholas square has a tram and bus stops. The location of the apartment is perfect for visiting Prague as a tourist. The apartment has everything you need to be comfortable during your stay. Dean and Jacqueline were extremely helpful to us. If you’re going to visit Prague, stay here in Prague 1! We loved the apartment. It was quiet, clean and well located. Dean helped us with our luggage. No elevator, but stairs were easy. The apartment is located at base of the steps from the castle. Lots of good restaurants near by . Terrific location! Steps to the Castle! My husband and I and another couple stayed for 3 nights in this very comfortable, well located apartment. The layout of the apartment, and how big it is, allowed for privacy and comfort. It was a treat looking out the windows and seeing the Castle! Dean was a terrific host- very responsive to all of our questions and very accommodating in securing transfers from the train station and to the airport. Overall, we four were very pleased with this apartment and would highly recommend it to any travelers. Location, location, location...it was perfectly located for our stay in Prague. This apartment has all the basics albeit the owners should improve on the pillows which were small and thin, and the towels which were stiff as a board. The place was very clean and the kitchen well equipped. One item to note is that the bathrooms are not ensuite but separate. Aside from that it was exactly what we needed for our stay. It was close to restaurants, the Charles Bridge and easy walking distance to old town. The best part was that we were at the base of the castle steps making it easily accessible to that beautiful area. One last note, we were a bit overwhelmed with how Prague is so crowded with tourists. It was nice to come back to the apartment away from all those crowds and it was quiet at night. 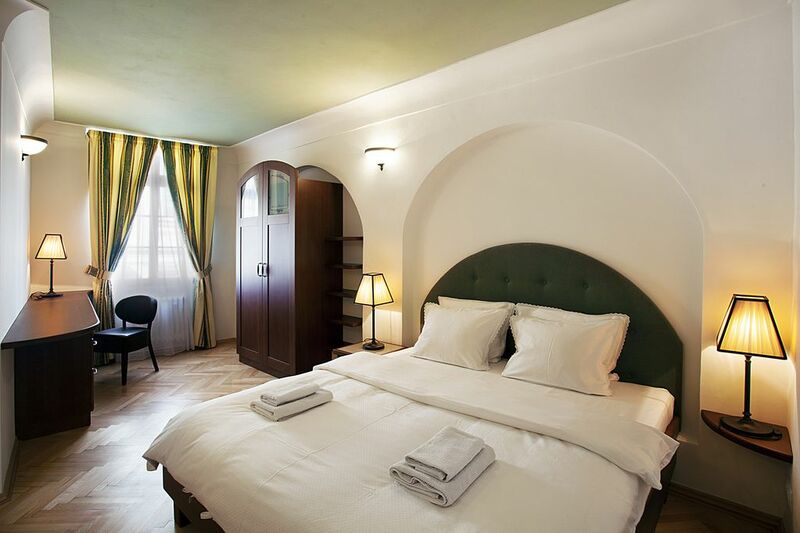 We are located in historic Mala Strana. This is the oldest and most charming neighbourhood in Prague. We are directly next to Prague Castle so you can walk to all places of interest from here. Prague Castle is a 3 minute walk from us. Charles Bridge is just 5 minutes away and Old Town Square is a 15 minute walk. There are great transport connections nearby as well. You will not find a more attractive and quieter place to spend your holiday. Our street is calm with nearly no traffic and it ends with the back stairs to Prague Castle. You will never find the noisy crowds of Old Town near our building. Some of our apartments have incredible views of our area. Mala Strana, or Little Quarter. Mala Strana is filled with passageways, galleries, cafes, restaurants and many styles of architecture. Our building alone has a wonderful story to tell. Nearby sights include: St. Nicholas' Church, Strahov Monastery, Church of Loreto, Petrin Park and the Infant of Prague Church. Rates are for 2 persons. Each extra person is 10 eur/day.